Set in a tropical garden environment, the Paradise Buffet is an all-you-can-eat food fantasy unlike any other in Las Vegas. Join us for breakfast, lunch or dinner. 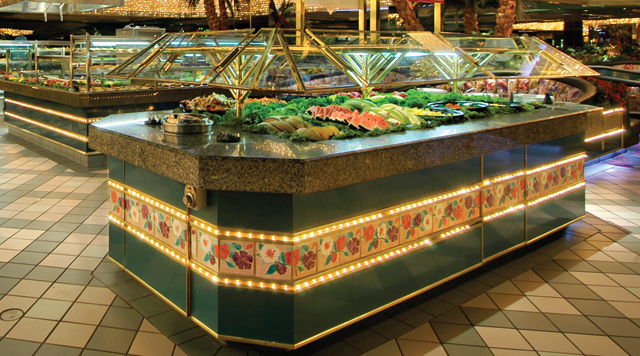 Paradise Buffet features a variety of special nights, weekend champagne brunch and fresh sushi made nightly. Open for breakfast, lunch and dinner, the Paradise Café is located within the beautiful Paradise Buffet featuring a diverse menu of cafe favorites with a touch of island flair. You can find something for every appetite on our menu, including breakfast served all day. *All pricing shown is with B Connected Emerald, Sapphire, Titanium, and Onyx membership. Must present card upon payment. Regular and Ruby price is $1 additional. Price does not include tax and gratuity.